– Experience-based referrals. These referrals are generated as a direct result of your firm’s work with a client or another attorney on a case and are oftentimes the most powerful. – Reputation-based referrals. These referrals occur when someone recommends your firm based on their knowledge of your firm’s expertise and reputation in the industry. These individuals may have never worked with you personally, but they recommend your firm based on your perceived expertise in the industry. Provide excellent service. Provide excellent service to all clients at all times. Always keep the lines of communication open. Go a step further and remember their birthdays, special occasions and children’s names. Find ways to remind them you are still around after their case has closed and that they are important to you. This can easily be done through email marketing and direct mail campaigns. Get feedback from existing clients. The first step in getting more referrals is to review your current level of service- from the person answering the phones to the attorney and paralegals working the cases, all members of the staff play an important role. Get feedback from your current clients on the level of service provided by all employees at your firm to ensure you are meeting their standards and expectations. Use surveys. At Pristine PR we use online survey software and questionnaire tools to capture valuable client feedback. Sites such as Survey Monkey, provide free online questionnaire and web-based survey solutions, allowing you to create and publish online surveys in minutes, collect the responses and view the results graphically in real time. Getting your client’s feedback is invaluable to growing your practice. These survey tools can also alert you of negative experiences quickly and give you the ability to mitigate the situation, before any negative information can be posted online about your firm. Staying in touch with what your clients’ value allows you to identify new trends and can have a substantial impact on expanding your referral client base. Make the consultation count. If the client hires you on the spot, they will likely spread the word about you. Give them an extra business card and let them know that any client they refer to you will receive a free consultation. Make it known to your clients the value of the referral. The welcome letter in your new client packet should include a mention telling new clients your business relies on word-of-mouth referrals and if they feel you have provided them with excellent service to please share your information with others who might be in need of your services. A great time is right after a win or when the client compliments you. Case closed. You should always end your representation with a request for feedback and a reminder to share your information with others. Network with a purpose. Connecting with the right professionals can lead to a steady stream of referrals. Build relationships with other non-competing businesses that have a similar client base as your own. For example if you specialize in auto accident cases, build connections with doctors and chiropractors. Family law attorneys- build referral connections with therapists, accountants and real estate professionals. But make sure anyone you refer your clients to have the same professional standards as your firm. 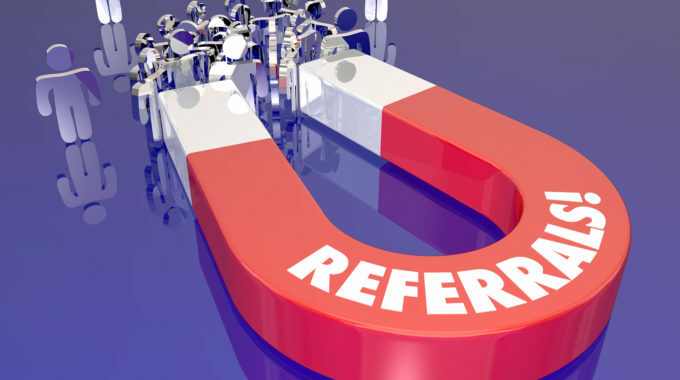 Track your referrals. Always ask new clients how they heard about you, and who referred them to you. Remember to thank these individuals via email or through a hand-written thank you card. Provide valuable content. Get more referrals by providing valuable content to your contacts, which they can share with their network, such as helpful blogs, consumer updates and alerts, webinars and podcasts. Establish attorney and referral partnerships. Establish partnership agreements with other law firms in which you agree to refer certain cases to each other. Invest in that relationship by sending gift baskets and cards for various occasions throughout the year. Get out there! Secure speaking engagements at local clubs, organizations, or groups and offer a free 15 to 30 minute legal consultation to all attendees, either to use themselves or give to a friend. Connect with local trade groups and organizations in your community. You can sponsor local events and charities. Not only will your efforts be benefitting the community, but you are also creating contacts with the people and staff involved in these organizations and trade groups. Thank your clients. Send a personal thank you note or gift when a current client refers a new client to you. This lets your clients know their opinion is important to you, and that it means a lot when they recommend your firm to others. E-newsletters and direct marketing. Send out an email newsletter to clients every two weeks, keeping them up to date on the latest happenings at your firm. This will keep you in front of past and current clients on a consistent basis. Do not exceed the two-week rule, more sends will result in more unsubscribes. Encourage clients who receive your e-newsletters to forward to a friend or family member, who may be in need of your services. Supply printed resources for various organizations to hand out in their offices or post on bulletin boards. Social Media. Utilize LinkedIn, Google+, Facebook and Twitter to network with other lawyers. Be an active participant online. – 92% of consumers trust referrals from people they know and those people are four times more likely to purchase a product or service if referred by a friend, according to a recent Nielson study. – 74% of consumers identify word-of-mouth as a key influencer in their purchasing decision. – 49% of U.S. consumers say friends and family are their top sources of brand awareness. So how does all of this translate for law firms? Studies show that the majority of people are more likely to do business with a company if they personally know someone who had a good experience with that company. Bottom line: One of your greatest marketing tools as a law firm is your current client base. Effectively gathering positive testimonials from this group and having them sing your praises to others will not only boost your number of referral cases, but also your reputation! If you have any questions on this topic or would like to hear how the latest media, marketing and technology strategies can help grow your law firm, contact us TODAY at (954) 376-3683. Also serving Central Florida and surrounding areas at (407) 982-1707. © 2019 – Pristine PR. All Rights Reserved.